Wonder Box is a very good learning platform for kids. It allows them to explore a wide variety of educational content tailored specifically to cater to their learning needs.WonderBox’s library hosts over 3000 videos, maps, images and content that spans different topics including science, languages, geography, and sports. This content is curated by teachers and educators and targets all grades and ages. WonderBox provides learners with a powerful and fun tool to enhance their creative thinking. Kids can use drawing tools and stickers to create new things. 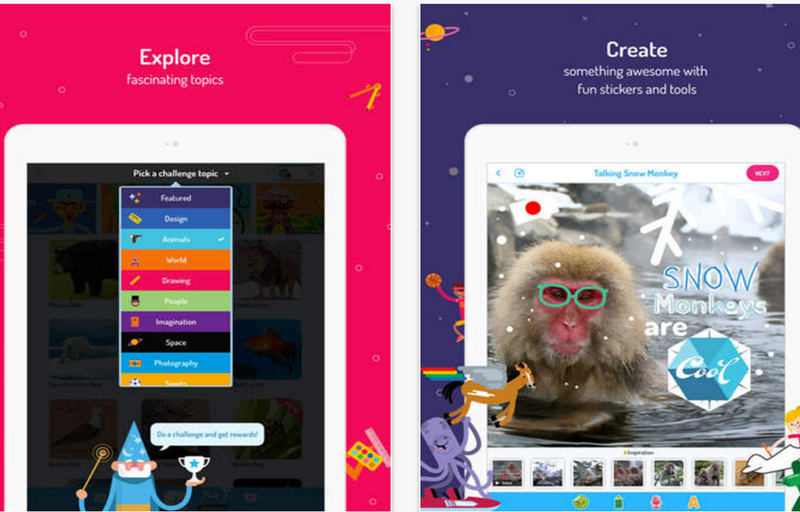 The app also offers a number of fun challenges to inspire kids to design, reflect and create.For instance, they can build a treehouse, write with hieroglyphics or simply make a fun talking president. Creative possibilities with WonderBox are limitless. Once their creations are ready, kids can share them with their parents, family and friends in safe and private messages. WonderBox allows parents to take complete control of what their kids are doing on the app. And did we mention that this app is completely free with no in-app purchases!